John Woods Nurseries is this week previewing four new plants from its 2012/13 range at the HTA/GMG Annual Press Day at Capel Manor College. 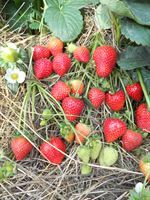 A new ever-bearing variety that produces delicious sweetly flavoured fruit continuously from July to October. The development of Buddy marks a change in the way ever-bearers have been viewed over the last ten years. The emphasis for ever-bearing varieties has been high yield and long shelf life, but flavour has not always been exceptional. Buddy produces delicious sweetly flavoured large to medium sized fruit, glossy and regular in shape. High in vigour it can produce a yield of up to 967g per plant. Height and spread: 20cm x 40cm. Every journalist attending the event will receive a complementary Strawberry Buddy. Rhododendron Hans Hachmann, an evergreen compact shrub with a dark glossy evergreen foliage which reaches a height of approximately 1.3m in 10 ten years. Flowers are produced in profusion through late April / May. The flowering truss is made up of distinct, almost saucer shaped bi-colour reddish purple edged flowers with a white inner and contrasting red blotch on the throat. 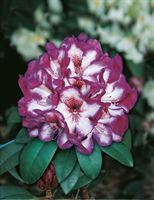 The initial crosses for this unique variety where made in 1991, a testament the dedication of the Hachmann family in breeding unique Rhododendrons. Rhododendron Hans Hachmann is hardy to below -20°C. Part of the Waterers Ericaceous collection. Rhododendron Metallica, a compact form which is uniform in growth. Easy to grow, Metallica has a compact dense habit with deep glossy evergreen foliage which, once established, is almost smothered by flowers in late April / May. The flowering truss is made up of distinctly-coloured purple flowers with an equally distinct deeper purple blotch on the lower petal. Height and spread: 1.2m x 1.3m in ten years. Part of the Waterers Ericaceous collection. Representing exciting colour breaks, these two Rhododendrons can be grown in large patio containers and will thrive in light shade. They also make a useful screen if planted en masse and their evergreen, compact rounded dense form make a useful foil for other plants when they are not in flower. Rhododendrons Hans Hachmann and Metallica reliably flower year after year with very little maintenance. No pruning is required, however for best results, remove flower heads once past their best. Cercis Ruby Falls, a deciduous tree, originally from the US, the first ever purple leaved weeping Cercis it has an elegant and unique weeping habit and multiple seasons of interest. Cercis Ruby Falls produces reddish purple/pink blooms on bare stems in early spring followed by attractive foliage; dark burgundy heart-shaped leaves which have a luxuriant glossy sheen as they unfurl in spring. Ruby Falls is being hailed as a weeping version of the popular C. Forest Pansy. Best grown in full sun and well-drained soils, Cercis Ruby Falls requires minimal pruning and is the ideal weeping tree for small gardens. It will even grow in a large container so would make a perfect tree the terrace or patio. Height and spread: 1.8m x 1.2m. The HTA/GMG Annual Press Day, hosted by Lady Salisbury, Trustee of Capel Manor College, takes place at Capel Manor College on Tuesday 19 June, with registration commencing at 9.30am. For further details, visit www.capel.ac.uk. For further information about John Woods Nurseries, visit www.johnwoodsnurseries.co.uk.